Marspedia strives for accuracy, but makes no claims about the accuracy of statements on this website. Marspedia strives for scientific consensus, but does not necessarily support, approve, or agree with any point of view expressed by any of the various authors of articles on this website. 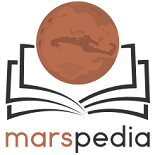 The content licenses used on Marspedia do not apply to other wikis in our Interwiki network.